When it comes to making movies, Carl Bessai knows what he's doing. The prolific filmmaker pumps them out on average of one per year and this year he's outdone himself with not one but two films. One is a family comedy titled Fathers&Sons (a must for fans of dysfunctional family comedies) and the second of the duo and Bessai's first foray into genre film making, is Repeaters, a film many have compared to Groundhog Day based on the premise alone but which has much more in common with Bessai's previous films than with the comedic classic. Kyle, Sonia and Weeks are in rehab, counting through the days (and steps) until it's all over. Today is Step 9: making amends. The group gets their day passes and each heads off to their own private hell: Kyle attempt to patch things up with his sister, Sonia sets off to make amends with abusive father and Weeks to see his father who is currently incarcerated and blames his jail stint on his son. The day doesn't exactly end well for the trio but they need not worry because a series of events leads them to wake up the next morning to re-live the day. During the first reset, the trio try, once again, to set things right but by the end of the day, Kyle and Weeks have decided to take advantage of the situation. Realizing that they are stuck reliving the same day, the trio get out of control robbing liquor stores, getting high and living in the moment knowing that when they wake up, the previous day never happened. Kyle and Sonia quickly realize that there must be some reason why the day keeps resetting and they're committed to make amends with their family and perhaps get themselves out of the loop in the process but Weeks is out of control, pulling more dangerous stunts with each repeat until the day when something happens to suggest that this is no longer a repeating day. Too bad Weeks has gotten himself into some serious trouble. Though it has a mild sci-fi aspect to it, true to Bessai's style Repeaters is a tale dependent on its characters and their actions. This is very much a story of morality and of doing the right thing even when you know you can get away with the bad. 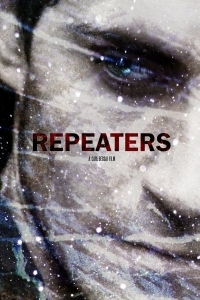 In this case, the ending of Repeaters feels a bit weak, not sticking to its message all the way through but it's a prototypical Hollywood ending and for a film that is as much of a Hollywood calling card as I've ever seen from Bessai, it's a little forgivable (sometimes the only way to get ahead is to sell a little piece of your soul to the devil). Bessai employs the help of some of his regulars including Ben Ratner as the guidance councillor, Gabrielle Rose in a small role as Kyle's mother and Richard de Klerk in a change of pace as the out of control, unlikable Weeks. New to the Bessai family and both excellent in their roles are two up-and-comers Amanda Crew and Dustin Milligan. Bessai is a master at turning small budgets into expensive looking films and Repeaters is no exception. Though not exactly effects heavy, Bessai's film is a lot glossier than most of his previous work and the sci-fi aspect is a nice change of pace for his dramatically heavy filmography. Wonder if he'd consider making a horror film? Though not my favourite of his works Repeaters is Bessai wrapped in commercial trappings. Not that Iâ'm complaining, I love Bessai's approach to genre film making and I hope he tries his hand at it again but I'm also hopeful that he'll continue to make the small indie dramas that have become a staple of my yearly festival run.